The long cold winter seems to be over and the weather is warming up. People are going to be spending more time outside; I already see charcoal braziers being set up here in the neighbourhood. One dish I’ve always been fond of with barbecue is a nice, easy to prepare, spinach salad with bacon. The spectacular thing about this salad is its versatility. You can offer a liberal assortment of extras to garnish or enhance this spinach salad in many ways. I always set out my homemade sweet sliced pickles and jalapeno bread & butter pickles, along with a personally variable spinach salad that is always devoured quickly. 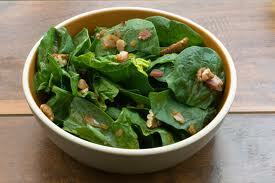 Here is a basic spinach salad method that can be made diverse in accordance with tastes and/or available groceries. Most grocers stock those bags of baby spinach; so tender you can eat the stems. They are not as delicate as lettuces and are very convenient for outdoor get- togethers. What do you say? Come on, let’s do it. Dry spinach if you washed it; keep in the refrigerator until ready. Cook the bacon until crisp, remove to drain on paper towels. Save the bacon fat, crumble the drained bacon. This can be done earlier. When you are ready, place the spinach in a salad bowl. Heat the skillet of bacon fat; cook the onions and garlic gently for a few minutes. Stir in the vinegar, salt and pepper and bring to the boil. When boiling begins, stir and pour over spinach and then sprinkle on the crumbled bacon. That’s the basic spinach salad but you can amend it in several appetizing ways. Try your own personal spinach salad at your next cookout and you’ll probably discover your own ideal additions too. I’m sure you’ll love it. Although I'm heading into winter here in Oz, your salad looks yum and so easy to prepare. Growing up in the country, we used to have something we called 'green stuff'. It was mustard greens with fresh green onions and radishes from the garden with the hot bacon grease dressing it. It's one of those dishes that meant summer was here and the eating was gonna be fresh and yummy! I may have to try this.... sounds yummy!!!! I usually take it but change the bacon apple. Is lighter. Really nice salad. I love spinach in salads, cooked, dips, hmmmm. Thanks for sharing.